Facebook Local combines Events and permanent Places to a single search engine powered by Facebook’s 70 million business Pages plus reviews and friends’ checkins. You can easily use search filters such as art, causes, health, gardening, music, parties, theater, food, fitness, film and more. View in list mode or map mode. Create your own calendar. So many fab features. Your “in real life” social life could suddenly really blossom! Facebook Local is only available in the US for now, on iOS and Android. It’s hopefully rolling out to more countries very soon… although one of my Facebook fans from New Zealand says he has the app already, yay! New Facebook ‘Local’ App: Discover places to go and events happening near you. I’m a big fan of automated Messenger bots and am using ManyChat myself. (You can tap here to send a test message to my Page now: m.me/marismith) People’s preferred mode of communicating on the planet is really shifting over to messaging apps. Facebook’s Messenger and WhatsApp (and China’s WeChat) are rapidly becoming the more dominant forms of interaction, both for business and personal use. This epic guide by my friends at ManyChat is packed with helpful information to understand and use Messenger chatbots in your marketing. Two thumbs up! Speaking of change, what’s on the horizon when it comes to content marketing? This list of predictions makes it easier to prepare your content plans for next year. 2018 is right around the corner. Time to start planning! Yeah! Video Gear List – free download! P.S. NEWSFLASH!! It’s finally here — my long awaited VIDEO GEAR LIST free resource is available for download. 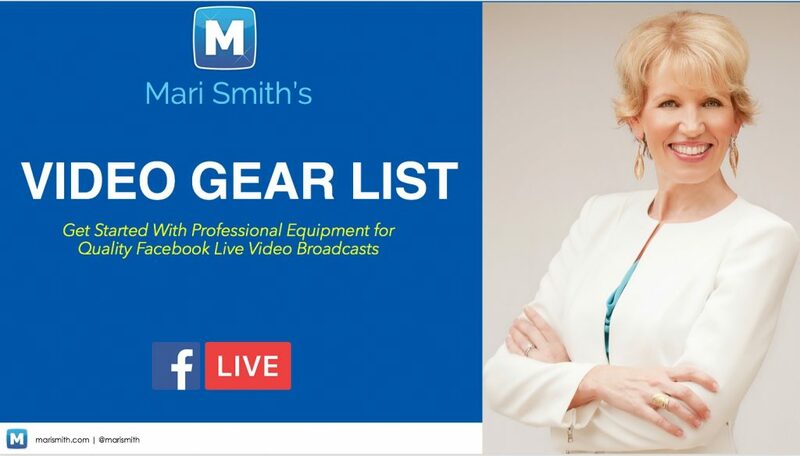 If you haven’t already, go get this awesome 28-page Video Gear List to help you get started with professional equipment for quality Facebook Live video broadcasts! This gorgeous resource is in 3 sections: Lighting, Microphones and Cameras. Plus, my brand new Facebook training program is about to launch: FAST FACEBOOK RESULTS: Facebook Ads Strategy Training & Facebook Live Success Secrets. We have something super special lining up for Black Friday, woohoo!